email us at PrismBookTours(at)gmail.com with "Destiny Bay Grand Finale" in the subject line. 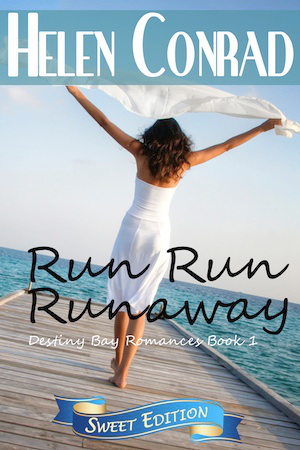 Run Run Runaway (book one in the series) is FREE for Kindle from today through June 4th!!! Her head shot up at the familiar voice, but the late afternoon sun was behind him, wrapping him in a mantle of light spears. All that stood out was a set of very wide shoulders and the vague outline of dark glasses hiding his eyes. She smiled at him, and his face softened, eyes hooded but not unfriendly. “I’ll be waiting for your call,” he teased back. He turned and looked at her. “No pictures of boyfriends?” he asked softly. He hesitated for a moment, watching her. The tumbling chestnut curls invited an affectionate hand to rake through and put them in order. When she looked up at him, her eyes barely visible beneath the windblown hair, she looked so forlorn and vulnerable he had the urge to sweep her up in his arms . . .
Ah, if she only dared tell him! “Let’s race,” she challenged. “Down to the pier and back. The winner gets … a kiss,” she said wildly, dropping his arm. Who doesn't argue with their parents? I was proud that Jennifer went home and tried to reconnect with her parents. She definitely got her stubbornness from her dad. I enjoyed reading about Destiny Bay and I am reading A Little Blackmail next! She didn’t really panic. A strange, white blankness came over her. Her mouth opened in a silent scream, and she tried to think carefully, logically, all the while the earth was rushing toward her as though she were in a jet plane aimed into the side of a mountain. Jennifer is quite the wild child. It remains a mystery why she chooses to throw herself out of airplanes, among other dangerous things, until later on in the book. The book is a quick read that I finished in one afternoon it was hard to put down I had to see how Jennifer’s story would play out. I love a good clean romance that has a great story that is well written that teens as well as adults will enjoy. This is my first book by the author but I’m excited to read the next installment in the Destiny Bay Series. It occurred to Jennifer that the more she ate, the less time she’d have for talking. “You know what, this dessert list looks awfully good. Could you add a hot fudge sundae to my order?” She smiled at the waitress. I liked how carefree, but responsible (because she really is regardless of what others think) Jennifer is. I loved her teasing and fun nature. She definitely had her insecurities and they were her downfall on more than one occasion, but they fit her character. I enjoyed the beach town where the book was set. It was fun to imagine what it would be like to live in a beach community. I liked the interactions between Jennifer and Reid. You feel the history and connection between them. “We can’t talk in here,” Reid yelled, his lips almost pressed against Jennifer’s ear. “You’re not supposed to talk in here,” she yelled back. It 's a novel sweet, soft and clean, talks about love, friendship and family. "Vanessa, Vanessa," he murmured, grinning. "How you've changed from the passionate woman of my dreams." "I'm not Vanessa," she hissed. "Sit," he ordered, and she sat. "What would you like to eat?" "Look at her. After she travels, she goes into some sort of a time warp. She can hardly remember her name ..."
"I can remember yours," she said sweetly, pretending to smile, but glaring at him from beneath lowered lashes. "‘Mud,' wasn't it?" Matt was also a fun male protagonist with all the usual charming personality (when he wanted to be charming) and good looks. There was definitely plenty of romantic tension between him and Janet. “What?” His outrage echoed in her head. “Where are you?” She hesitated. What in the world was she going to tell him? If she told him the truth, he and Howie would be over here in no time, ready to rescue her. She couldn’t have that. “Do I look like her?” she asked. “Like Vanessa?” He wasn’t sure, actually. He’d seen Vanessa’s picture in the magazine article about Matt and his enormously successful oil operations in Brazil and Argentina. He knew Vanessa was attractive, with long black hair — so that fit fine. That article was what had given him the idea to try this elaborate hoax. “You’re much prettier,” he admitted. Maybe it was her sweet red mouth or the way her black hair brushed against her cheek. Maybe it was the way her smile seemed to light up the sky, sending a wave of intoxicating warmth through him. Whatever it was, for the moment at least, he was hooked. Janet’s life has been academic and protected until now. Mistakes are made and her cat ends up being taken by Matt Carrington as a prop in a con he’s running against a sweet old lady. Janet takes the plunge into the dark side when she tries to steal her Alexander back and gets caught up in Matt’s plot, blackmailed into pretending to be his wife. Con men are usually charmers, and Matt is no exception. Soon Janet is torn between what she knows is right—and what her heart begins to feel. I thought it was funny that the opening scene showed Janet as a cat burglar trying to steal a cat. She isn't that type of person at all. She values honestly above all else and hates to be caught in a lie, but that's exactly where she finds herself when she is discovered by the one who "stole" her cat--Matt. It 's a story written really well, is smooth and addictive, once you start it is hard to quit. It 's a novel sweet and funny , even a little mysterious . A Little Blackmail picks up with Matt Carrington (brother of Reid Carrington from Run Run Runaway). Matt is obviously hiding something, so Janet's unexpected arrival (behind the curtains of his second story bedroom!) definitely has the potential to complicate things. I was delighted by the "marriage" of convenience aspect—another favorite storyline of mine. He looked over at Janet on the bed, her dark hair spilled out in a midnight cloud. She looked like an angel against the white sheets. It had been a long time since a woman had captured his natural male inclinations like this one had. He tried to hide it with jokes and lighthearted banter, but it was there. It never left him. Matt comes off as the bad guy at first but as bits of the story come out, we learn right along with Janet what Matt is really up to. Maybe he isn’t quite as bad as he first appeared to be. She waited, heart pounding, in case anything inside was going to react, if any alarm was going to go off. There wasn't a sound. Holding her breath, she pushed a little more. The door glided smoothly, leaving a six-inch opening. Janet stared at it, waiting, her heart beating furiously. He grinned. "Right after we're married." "Oh." She hardly knew which way was up any longer. "Are we getting married?" Reaching out lazily, he pretended to brush a curl from her cheek and tuck it behind her ear. He gave her another wink and turned to go, making his way back across the lawn. The author has created a great series with characters that could be my neighbors. The Carringtons are definitely sought after men. “To chance encounters,” he said, his eyes making the statement provocative. “To miraculous escapes,” she countered, her chin rising with the challenge. There was a charged tension between them as their gazes locked, and then the low rumble of his laugh spilled out, the rich, textured sound of it rubbing against her in a way that did nothing to soothe her jangled nerves. Grant’s cool gaze took in exactly what was going on. He looked at Carrie and immediately saw the anger in her eyes. They’d been baiting her and she was furious. A deep feeling of pure satisfaction filled him. Their loss just might be his gain after all. The ocean breeze blew her hair across her face, and Grant reached to brush it back. Emotion welled up inside her, and she grabbed his hand, pressing it to her face, pressing the palm to her lips. Carrie is a very naive and inexperienced woman and feels that Grant is a danger to be around, just like a Big Bad Wolf (I loved that part!). She's also pretty stubborn and quick to assume. Yet, she sure is willing to give her heart away faster than she wanted to. He touched her chin with one lone finger. “Always,” he said, and it was as much a warning as a promise. Grant has issues but maybe that’s why I like him so much he’s very much a broken guy who needs a girl to heal his heart. Carrie's determination to help Grant recover from his injury—despite the fact that he thinks he can recover on his own—was a great match for Grant's stubbornness. I enjoyed seeing how Carrie grew throughout the book, to the point where she was a strong character rather than someone who has trouble standing up for herself. Carrie shuddered, averting her gaze. She was deeply troubled by what he’d told her. She was beginning more and more to understand why he was so hard on himself, so hard on her. The attraction, chemistry and emotion in this book are on high at all times. She was living her own worst nightmare. “I can’t accept that,” she repeated. This is the funniest novel in the series, but is also very sweet and romantic. The author has also created for this story characters realistic, fun and very different from each other. 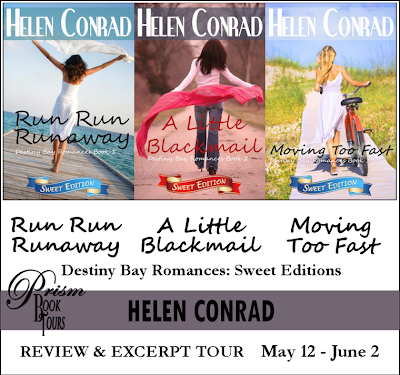 Run Run Runaway is the Sweet Edition of My Little Runaway, the story of Reid Carrington and Jennifer Thornton. The trouble is, when you run from your problems, you often find out your biggest obstacle is along for the trip–it's you! Reid Carrington realizes that when he finds Jennifer and recognizes the quiet desperation in her eyes. Can he save someone who doesn't want to be saved? Or like a lifeguard rescuing a swimmer, will she pull him down into the undertow in the end? Recipes for Jennifer's Mango Salsa and Tilly's Bruschetta included. A Little Blackmail is the Sweet Edition of Wife For A Night, the story of Janet Cardona and Matt Carrington. Moving Too Fast is the Sweet Edition of Too Scared To Breathe, the story of Grant Carrington and Carrie Harlow. Helen Conrad is an award-winning, bestselling author of more than 90 romances (over 15 million copies sold) published under various pseudonyms with Harlequin, Silhouette, Loveswept, and others. She is currently revamping and rewriting much of her backlist--some available in the US for the first time--to present on Kindle.